Gods of Egypt was one of three new releases that went up against two-time box office champion Deadpool this weekend, but it failed to dethrone the superhero adventure. Deadpool ended up winning for a third weekend in a row with $31.5 million. Gods of Egypt debuted in second place with $14 million, while working from a massive budget of $140 million, making it the first high-profile bomb of 2016. The movie also failed to impress critics, with just a 13% rating on Rotten Tomatoes. Earlier this morning, Gods of Egypt director Alex Proyas took to his personal Facebook page to trash the critics who dismissed his movie. "NOTHING CONFIRMS THE RAMPANT STUPIDITY OF MAN-KIND... Like reading reviews of my own movies. I usually try to avoid the experience - but this one takes the cake. Often, to my great amusement, a critic will mention my past films in glowing terms, when at the time those same films were savaged, as if to highlight the critic's flawed belief of my descent into mediocrity. You see, my dear fellow FBookers, I have never gotten great reviews... on any movie I've made really, apart from those by reviewers who think for themselves and make up their own opinions. Sadly those type of reviewers are nearly all dead. I guess I have the knack of rubbing reviewers the wrong way - always have. ADVERTISING This time of course they have bigger axes to grind - they can rip into my movie while trying to make their mainly pale asses look so politically correct by screaming "white-wash!!!" like the deranged idiots they all are. They fail to understand, or chose to pretend to not understand what this movie is, so as to serve some bizarre consensus of opinion which has nothing to do with the movie at all. That's ok, this modern age of texting has rendered them less than worthless, so they will probably go the way of the dinosaur or the newspaper shortly - don't movie-goers text their friends with what they thought of a movie? Seems most critics spend their time trying to work out what most people will want to hear. How do you do that? Why these days it is so easy... just surf the net to read other reviews or what bloggers are saying - no matter how misguided an opinion of a movie might be before it actually comes out. Lock a critic in a room with a movie no one has even seen and they will not know what to make of it. Because contrary to what a critic should probably be they have no personal taste or opinion, because they are basing their views on the status quo. None of them are brave enough to say "well I like it" if it goes against consensus. Therefore they are less than worthless. Now that anyone can post their opinion about anything from a movie to a pair of shoes to a hamburger, what value do they have - nothing. Roger Ebert wasn't bad. He was a true film lover at least, a failed film-maker, which gave him a great deal of insight. His passion for film was contagious and he shared this with his fans. He loved films and his contribution to cinema as a result was positive. Now we have a pack of diseased vultures pecking at the bones of a dying carcass. Trying to peck to the rhythm of the consensus. I applaud any film-goer who values their own opinion enough to not base it on what the pack-mentality say is good or bad." Alex Proyas' best reviewed films were his first two, the 1994 cult classic The Crow, which is now being rebooted, and Dark City, which currently stand at 82% and 74% "Fresh" on Rotten Tomatoes. Gods of Egypt was his first feature since the 2009 movie Knowing, which only scored a 33% rating on Rotten Tomatoes and earned $185.3 million worldwide from a $50 million production budget. 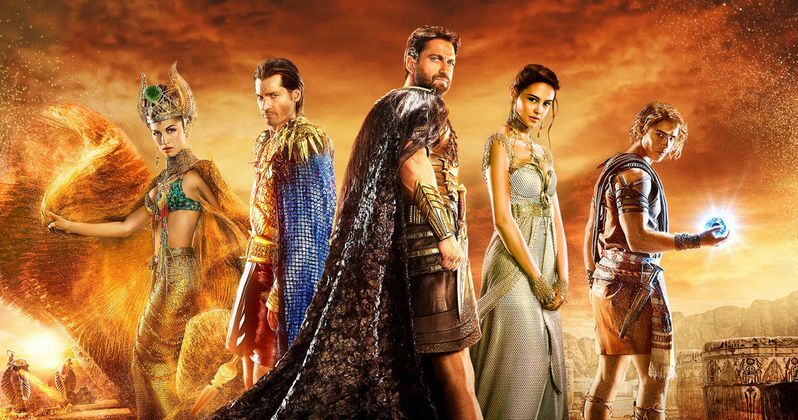 Many of the critics who trashed Gods of Egypt took issue with the film's lack of diversity. There has been some controversy surrounding Gods of Egypt, with critics complaining about its whitewashed cast that includes Gerard Butler, Nikolaj Coster-Waldau, Brenton Thwaites and Geoffrey Rush. The fantasy epic arrives amongst an Academy Awards show that is being boycotted for race discrimination. Of course, it isn't fully known why the movie failed to connect with audiences, but it's possible that the whitewashing controversy may have had some sort of impact. Magic, monsters, gods and madness reign throughout the palaces and pyramids of the Nile River Valley in this action-adventure inspired by the classic mythology of Egypt. With the survival of mankind hanging in the balance, an unexpected hero takes a thrilling journey to save the world and rescue his true love. Set (Gerard Butler), the merciless god of darkness, has usurped Egypt's throne, plunging the once peaceful and prosperous empire into chaos and conflict. With only a handful of heroic rebels opposing Set's savage rule, Bek (Brenton Thwaites), a bold and defiant mortal, enlists the aid of powerful god Horus (Nikolaj Coster-Waldau) in an unlikely alliance against the evil overlord. As their breathtaking battle against Set and his henchmen take them into the afterlife and across the heavens, both god and mortal must pass tests of courage and sacrifice if they hope to prevail in the spectacular final confrontation. The supporting cast includes Geoffrey Rush as Ra, Rufus Sewell as Urshu, Courtney Eaton as Zaya, Abbey Lee as Anat and Goran D. Kleut as Anubis. Do you think Alex Proyas was justified in his rant against the critics? Chime in with your thoughts below.